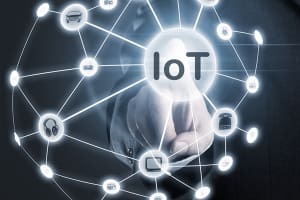 With over five hundred million chipsets sold to date, ZigBee - based on the IEEE 802.15.4 standard - has a foothold on becoming the go-to technology for wireless communication on the Internet of Things (IoT). 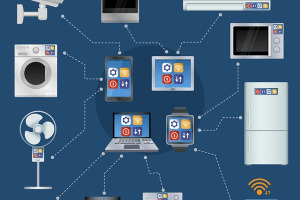 To increase its versatility and market share, the ZigBee Alliance has made its protocol stack modular, allowing other hardware platforms to work on a ZigBee network. Let's take a look at some modern ZigBee developments. According to a recent study, annual sales of ZigBee chipsets should reach one billion by the year 2023. These versatile, low-power chips are used in products such as connected lighting schemes (indoor and street lighting), smart electric meters, climate control devices, and home automation systems. 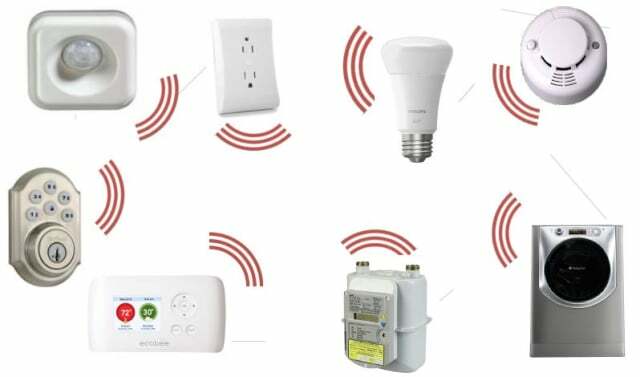 Companies making ZigBee-based products include heavy-hitters like Amazon, Comcast, IKEA, Schneider Electric, Signify (formerly Philips Lighting), and Samsung SmartThings. 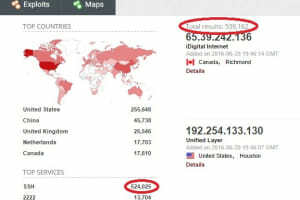 "ON World has closely followed the IEEE 802.15.4 category for the past 15 years and has tracked Zigbee technology since before its flagship specification was ratified in December 2004,” said Mareca Hatler, Principal Analyst at ON World. “Since then, our team has conducted extensive, year-round primary research on wireless sensing, tracking, and control in dozens of ecosystems – interviewing and surveying thousands of companies of all sizes across the entire value chain. Our findings indicate Zigbee leads the wireless mesh sensor network market and will continue to do so." 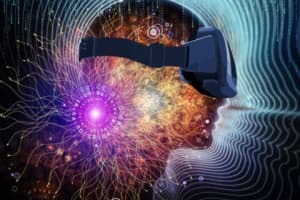 The unsponsored report was conducted and published by ON World, an independent research firm specializing in wireless communication and the Internet of Things. With a multitude of wireless protocols all vying for a share of the IoT, how does ZigBee compare to the other options? Let's examine some of the more popular choices in the wireless communication sector. You'd be hard-pressed to find a technology-filled building without WiFi these days, and a number of home automation systems rely on WiFi as their communication system. While this is simple, it often presents security risks. Weak network passwords on IoT webcams allowed the infamous Marai Distributed Denial of Service (DDoS) attacks in 2016. In industrial and commercial settings, IT managers are often reluctant to use WiFi-based IoT devices because of their inherent security risks. WiFi also has pretty high power requirements, making it unsuitable for battery-powered applications, including remote sensors. WiFi's star topology forces all devices to be relatively close to the router, although repeaters can be added to increase the range. And while WiFi's bandwidth is quite high, it's largely overkill for most IoT applications ... unless you want your smart fridge to stream a football game in real time. Unlike WiFi's star topology, Z Wave uses a mesh network, allowing any device to act as a relay point for communication. Z Wave also uses a fraction of the power that WiFi requires, making it more suitable for battery-operated devices. 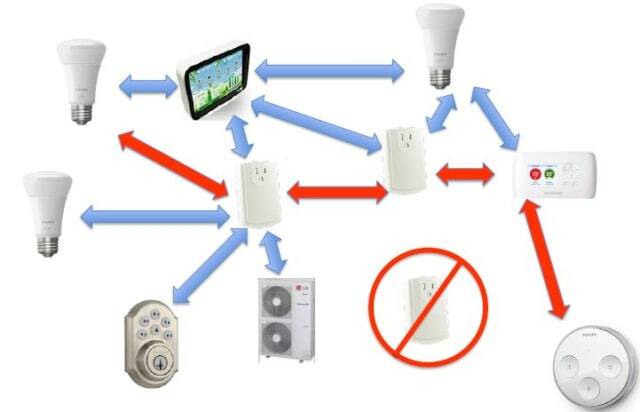 Z Wave is a proprietary protocol, which has both pros and cons. On the plus side, Z Wave devices must be certified by the Z Wave Alliance, which assures that they're all plug-and-play compatible with each other. The downside, however, is fewer Z Wave devices from which to choose. Z Wave operates at the relatively uncluttered 908 MHz band, reducing the chance of interference with WiFi, Bluetooth, and other wireless devices that use the 2.4 GHz band. 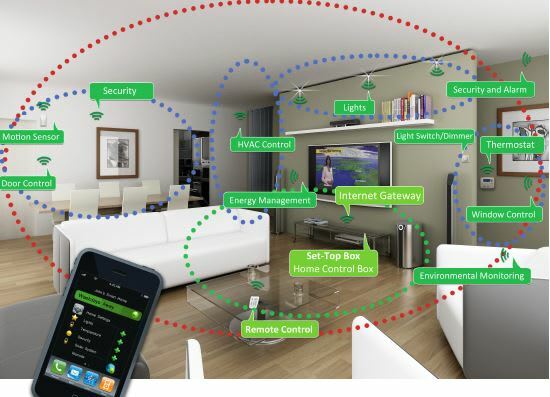 Like Z Wave, ZigBee features a mesh topology and frugal power requirements. A ZigBee network automatically configures itself and can adjust its configuration on-the-fly as devices are added, relocated, or removed. ZigBee's Green Power Protocol uses a miniscule amount of energy, often requiring as little as 50 milliJoules (0.05 Watt-seconds) per data transmission. Such paltry power requirements can often be produced by batteryless technologies such as kinetic or radio frequency energy harvesting. 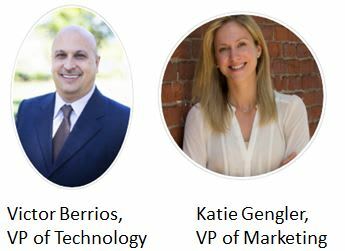 I spoke with officials from the ZigBee Alliance - Victor Berrios, VP of Technology, and Katie Gengler, VP of Marketing - to get some insight on ZigBee's products and how the alliance is addressing the various challenges related to wireless communication on the IoT. Specifically, I asked about proprietary systems vs open standards, the use of the ubiquitous 2.4 GHz band, and the many alternatives to ZigBee. Since ZigBee is an open standard, many devices are labeled as ZigBee but aren't necessarily compatible - or, at least, they aren't easy to interface with each other. To address this, the ZigBee Alliance promotes its voluntary certification program for companies making ZigBee-based products. The ZigBee Alliance lists products that have been certified through this program. They're working on a machine-readable format so the network controller can, upon seeing a new product on the network, determine whether the product is certified before assigning it to the network. If not, the controller can be programmed to send a message to the system administrator, who can then choose whether to allow it or not. In a relatively informal home network, the consumer may allow an uncertified device onto the network. In commercial and industrial applications, the IT person may be reluctant to do so. Proprietary systems are often seen in a burgeoning industry because it's faster to get new products to market that way. Once an industry matures, companies look for open standards, which give more choices and the security of knowing that if one vendor goes out of business, a compatible product made by another vendor will suffice. Is 2.4 GHz Getting Too Crowded? When I think about all the devices sharing that 2.4 GHz band, I'm reminded of the joke told by baseball legend Yogi Berra: "Nobody goes there anymore; it's too crowded." The reason it's crowded is that 2.4GHz is license-free, making it attractive to developers. The ZigBee Alliance understood that it's a busy channel, so they took steps in advance to make sure their products would work without causing or being affected by interference. ZigBee products can detect collisions and will retry transmissions multiple times. Third party testers found that ZigBee networks have little-to-no impact on WiFi since ZigBee packets are tiny and brief. WiFi affects ZigBee, but only in terms of latency - the ZigBee message eventually gets through, albeit with a 20 to 30 ms delay. Since the majority of ZigBee devices operate on human time scales, a fraction of a second difference in response time is negligible. 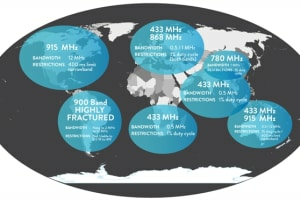 The report says, "By 2023, 4.5 billion cumulative 802.15.4 mesh devices will be sold worldwide. The majority of these will use smart home protocols such as Zigbee and Thread. However, other wireless mesh protocols such as Wi-SUN, JupiterMesh, WirelessHART and ISA100 Wireless have specific advantages for each of their respective markets including longer network range and high reliability." So why should a developer go with ZigBee as opposed to one of its competitors? Each system has a target market. ZigBee is aimed largely at smart homes while many competitors are focused on industrial applications, which have different needs. However, the alliance sees the need to accommodate different hardware protocols on the same network. For example, a home automation system normally deals with HVAC, door and window sensors, locks, lighting, and smart appliances, all of which have low bandwidth requirements. So what happens when a customer wants to add a security camera? Clearly, WiFi is the better way to put a webcam on a network. The ZigBee Alliance handled this by breaking up its protocol stack and allowing the layers to work independently. In the above example, the camera can use the WiFi hardware, giving it all the bandwidth it needs, but it can still connect to the ZigBee network through ZigBee's application layer, known as Dotdot. 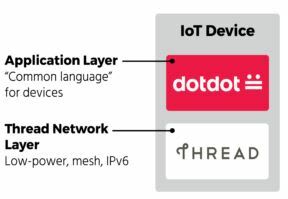 Thread is a protocol that enables IoT devices to connect directly to the Internet using the same IP layer that other Internet-based products use. To allow these devices to share the ZigBee network, Thread has adopted the Dotdot layer of ZigBee's protocol stack. In effect, ZigBee provides the common language that all devices on the network speak, while Thread delivers the IP layer required for specific products that connect directly to the Internet. 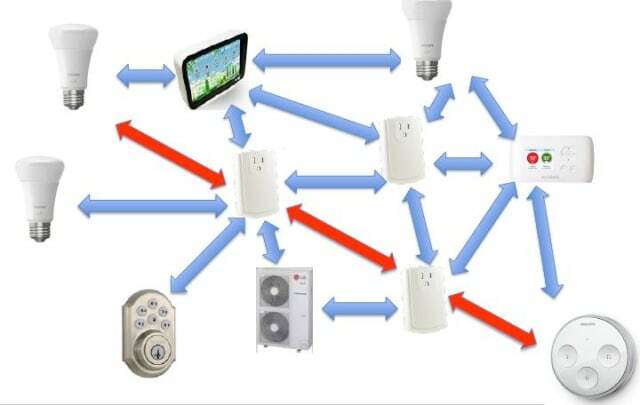 Between the voluntary certification program, which ensures that all devices on the ZigBee network are compatible, and the flexible protocol stack, which allows other hardware platforms to share the ZigBee network, it looks like the ZigBee language will be just as ubiquitous in home automation as the TCP/IP protocol is for Internet communication. "Alexa, please stream today's football game to the smart fridge display."